If You Were Me and Lived in … the Ancient Mali Empire is an excellent and enjoyable resource for children. 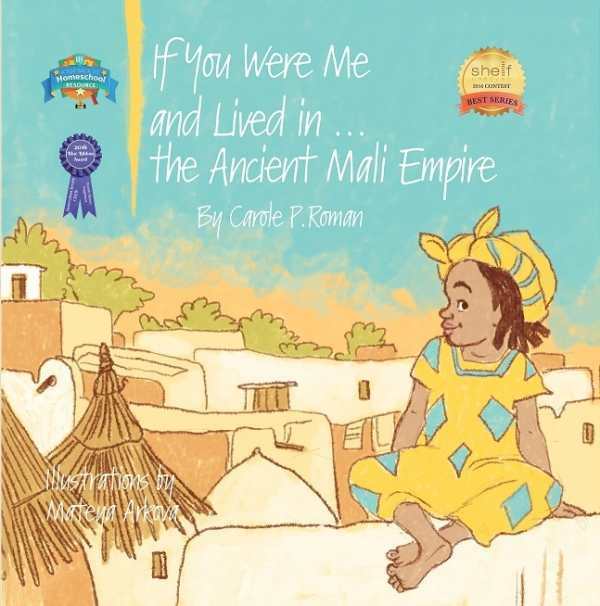 The mighty Mali Empire comes vividly to life in Carole P. Roman’s latest immersive historical picture book, If You Were Me and Lived in … the Ancient Mali Empire. The Mali Empire may seem an obscure subject when compared with some of the civilizations Roman has covered in her previous books. But using her practiced technique of casting the reader in the role of a child of the culture, Roman shows that the Mali Empire was historically and culturally significant, as led by Mansa Musa, its best-known king, who has been called the richest man in history. Roman shows typical life through the eyes of a central character, a girl, but also gives perspective from other views, through the girl’s family members. Her grandfather is a griot (storyteller) who tells the history of the Mandinka people, and other characters offer windows into the roles of men and women and the importance of trade, food, religion, and even marriage customs. If You Were Me and Lived in … the Ancient Mali Empire is full of interesting information that fits its narrative and is delivered in a natural way. The end of the book contains a guide to famous people in the Mali Empire, as well as a glossary and pronunciation guide. Roman’s work is a natural fit for school libraries—a treasure trove of information for student reports and projects. Mateya Arkova’s lively illustrations not only serve to accompany the text but also deliver visual information that might not otherwise come through, most notably with the colorful garb of the Mandinka people. Editorial mistakes are distracting, but they rarely conceal Roman’s meaning.